The playful yet sophisticated designs of the late Kate Spade are beloved by women across the world. 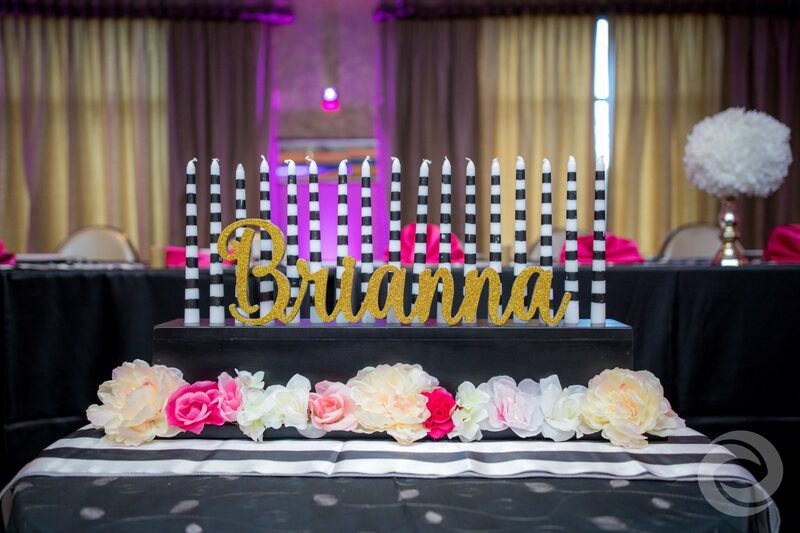 In keeping with this idea, Brianna chose to make Spade’s designs the center of her themed Sweet 16 celebration. Her friends and family gathered at The Imperia in Somerset, New Jersey for an evening of food, fun, dancing, and the inspiring ethos of Kate Spade. 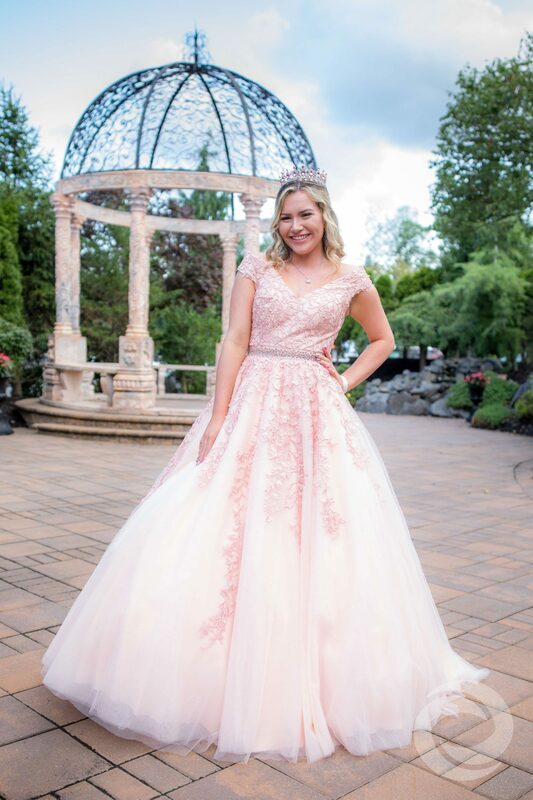 Before her reception, Brianna posed for formal portraits taken by Hurricane Productions photographer Corynn Egreczky. 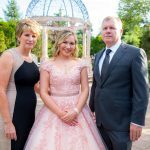 The birthday girl wore a pastel pink embroidered ballgown, while much of her family and Court donned formal black and gray attire. 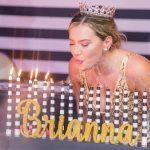 Later in the evening, Brianna changed into a gold embroidered mermaid-style dress to finish out her celebration. 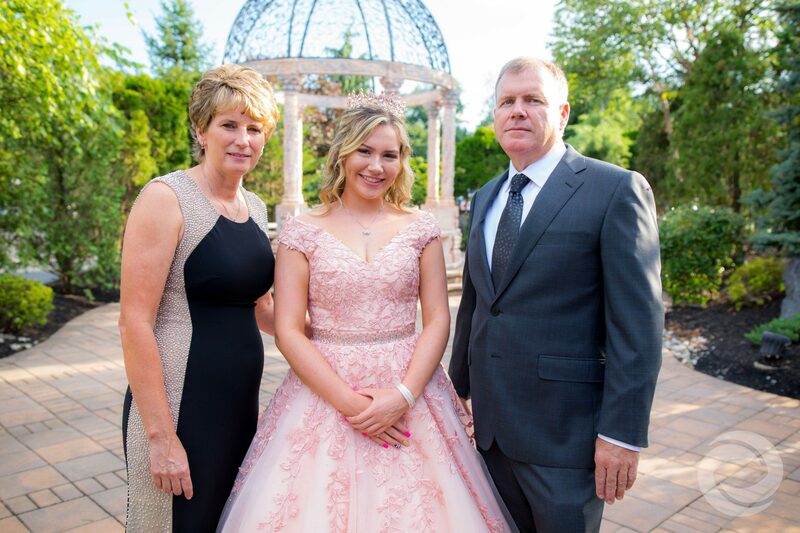 Brianna and her family decked out The Imperia’s Cristal Ballroom in Spade’s classic design colors: black, white, and gold with splashes of pink. 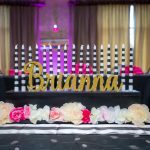 Hurricane Productions created a custom Snapchat geofilter, LED TV-displayed animations, and a Name in Lights projection – complete with a spade icon – as part of Brianna’s Photo & Entertainment package. 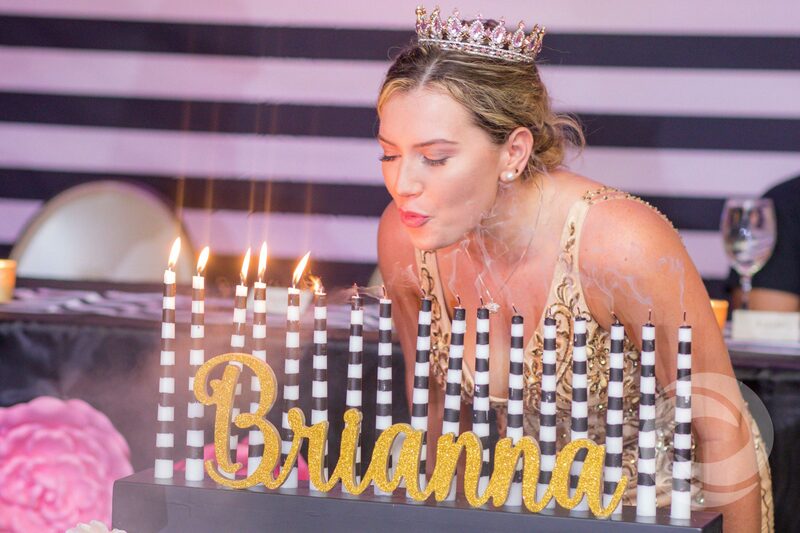 The Name in Lights design was also used on custom t-shirts worn by Brianna’s Court. 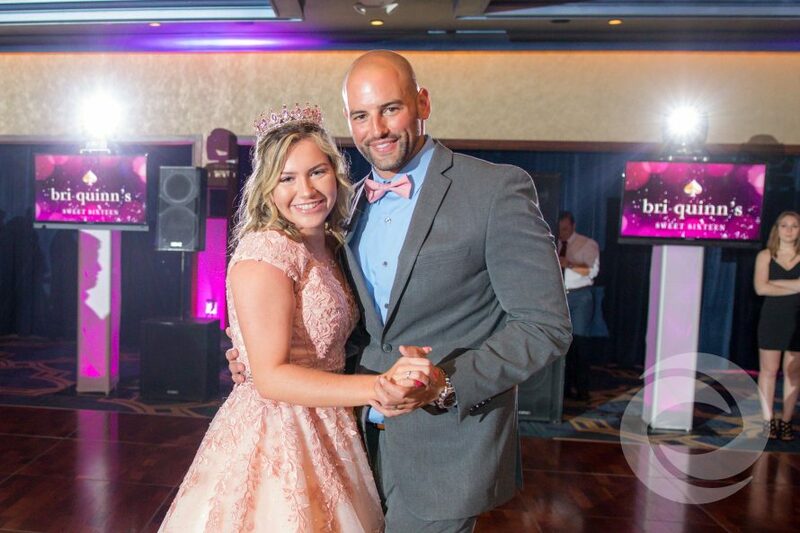 Brianna’s Sweet 16 entertainment team included DJ Nate Hawley and emcee Robert Padovano. 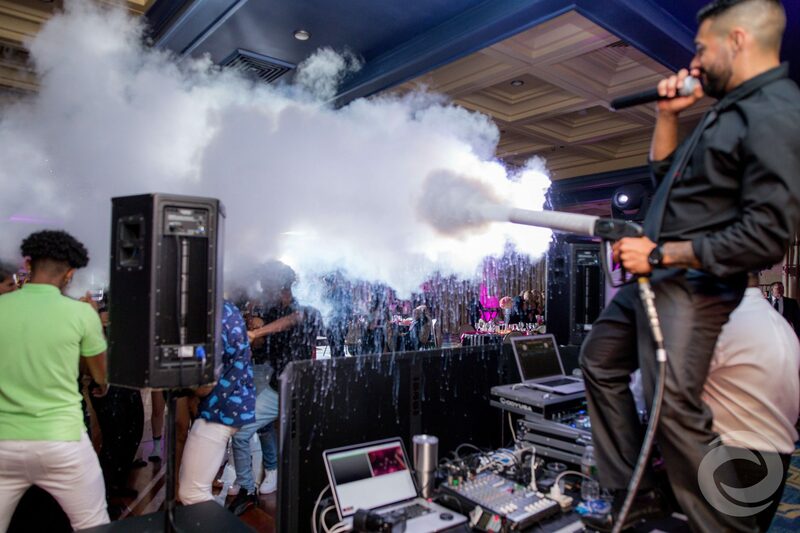 When guests weren’t dancing under the intelligent spotlighting, uplighting, and club-like dry ice cannon, they were using the attended open air photo booth to create memories of their own. 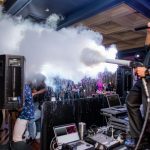 Want Hurricane Productions to help you celebrate your next special event? Visit our Sweet 16 pricing page or contact us for a custom quote. 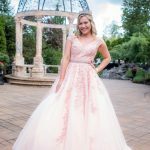 Or, if you’re looking for more Sweet 16 theme ideas, check out what some of our past clients have done.